First published in China in 2004, Will the Boat Sink the Water takes up what the authors call “fearsome ‘forbidden areas’ … about which the public has been kept in the dark”. It sold 150,000 copies in three months and received massive media coverage – a publicity blitz that had the impact of a “clap of thunder”. Although the book is supportive of China’s government and social order, authorities soon removed it from bookstores. It then sold an estimated 7 million copies in pirate editions. Earlier, Chen had written a denunciation of the disastrous pollution of the Huai River, which helped spur the government into a clean-up effort. Unfortunately, the success was temporary; a few years later, the polluters were back in operation. In Will the Boat Sink the Water, Chen and Wu describe peasant efforts to halt blatantly illegal extortions by local officials during the 1990s in the authors’ native province of Anhui (see map). In all the cases they describe, officials struck back violently, and several peasants were murdered by police or hired thugs. The peasants organised protest marches and deputations, and in some cases won the sympathetic attention of high officials in Beijing. But orders from on high proved ineffective, and when relayed down to the local level, usually came to nothing. Even in rare cases where murderers were prosecuted, the victims’ lot was no better. Chen and Wu are master storytellers. Their accounts are vivid, poignant and wise in their understanding of peasant life. All of these struggles turn on the issue of local taxation and what is done with the money. During the period discussed, township officials had unlimited power to tax the peasantry. With remarkable ingenuity, they developed an array of 269 listed taxes, and many more that were unrecorded or were invented ad-hoc. Do you own a pig? If so, there are five taxes to pay, often levied even if you don’t own a pig. Do you want to marry? Twelve taxes are due, including a “deposit for commitment to mutual devotion”. Does this spur you to complain? An “attitude tax” applies. Officially, taxes are not supposed to exceed 5% of income so these impositions were in large measure illegal. Many stratagems hid the excess levies and the siphoning of revenue to enrich government officials. The peasant struggles described by Chen and Wu usually involved pressing for an audit of the local government’s financial records. As a result, Chen and Wu write, China’s state bureaucracy has jumped “from 2.2 million in 1979 to well over 10 million today”, mostly in the countryside. Meanwhile, government services to the rural population – the vast majority – have fallen to 8 per cent of the budget, less than half the previous proportion. Meanwhile, rural officials enjoy the backwoods equivalent of conspicuous consumption. China’s countryside is a “gourmand’s paradise”, Chen and Wu say. The funds spent on dining at public expense, China-wide, could pay for four Olympic Games, every year – or “wipe out the disgrace … of children being kept out of school” because of a shortfall in educational spending. The concluding section of Chen and Wu’s book situates this drama of rural extortion within the longer story of “Chinese peasants’ burden”. Their brief account of rural collectivisation parallels what I wrote in ``50 Years After: The Tragedy of China’s `Great Leap Forward'''. They note that the vigorous peasant resistance to this process was crushed in the years just before the “Great Leap”, and that the “Cultural Revolution” (1966–76) struck further blows at agriculture. In 1977 the average Anhui peasant was producing no more grain than his or her counterpart 2000 years earlier. Residency requirements kept the peasants tied to the land, unable to move to the cities and locked in second-class legal and social status, lacking the economic and social benefits accorded to city dwellers. Following Mao Zedong’s death in 1976, Chen and Wu say the introduction of a “household contract system” (making the family farm the basic agricultural unit) unleashed peasant initiative, and peasant income rose 15 per cent per year for six years after 1978. But 1984 marked “a great historical turning point”. The government shifted its focus to urban development, and once again peasants paid the price. The crucial change, in Chen and Wu’s opinion, was endowing rural townships – successors to the people’s communes – with the power to impose and collect taxes. Others tell the story somewhat differently. Mobo Gao, in his U.S.-published Battle for China’s Past, stresses government pricing policy – raising the price of agricultural produce after 1978, then lowering it after 1984. Whichever explanation applies, it seems clear that the peasantry’s post-Mao prosperity was short-lived. By 2000, “agriculture had become a losing enterprise”, Chen and Wu state. “An army of peasants turned their backs on the soil and marched into the city.” In 2005, a quarter of Anhui’s population had become migrant workers. Migrant remittances to Anhui province are as large as the income generated within the province itself. Migrants return with new skills and ideas. Many of the migrants have been successful and become small-scale capitalists. Anhui has become more prosperous: enterprises founded by successful migrants in the province employ 17,000 workers. Yet Chen and Wu stress the negative side of migrant labour. In the cities, migrants retain second-class rural legal status. They are subjected to unpaid and unrestricted forced overtime, exposure to dangerous and unhealthy working conditions, delayed or denied pay, and arbitrary firing in case of sickness or accident. Back at home, “as the rural labour force drained away, local agriculture shrivelled and declined, creating a vicious cycle of increasing poverty and decreasing investment”, no one wants to stay in the country; “the peasants do all they can to leave”. Able and energetic young people are the first to go. “The dwindling human resources soon usher in a decline in material resources” and a bleeding away of investment capital. Judging by Chen and Wu’s account, the exploitation of China’s peasants today has much in common with what they experienced under Mao. It does not involve seizing the peasants’ land and driving them out of the villages and into the cities – instead, migrant workers retain their land rights and can return home. Oppression is largely extra-legal and enforced by ad-hoc violence, backed by the authority of the Communist Party. That may explain the party’s ambiguity regarding rural social conditions. Chen and Wu record six major national efforts to reduce burdens on peasants between 1993 and 2001, none of which, in their opinion, had significant impact. Local leaders routinely flout national directives with impunity. Between 1990 and 2000, per capita taxes paid by peasants were, on average, six times as high as those paid by city dwellers, even though the peasants’ average income was only one-sixth as great as urban levels. But party leaders are reluctant to undercut the power of local chieftains, the mainstay of government authority in the countryside. In 2003, in a major step to revive agriculture, China’s government eliminated all agricultural taxes. 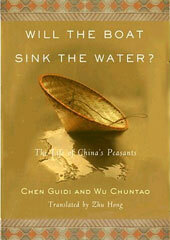 Chen and Wu, whose book was written immediately after that reform, are sceptical about its impact. They note the absence of any move to prune back the rural bureaucracy or to provide it with an alternate source of income. Taxes are being replaced by fees, they say, which are equally open to abuse. The underlying disparity in power and lack of legal remedies in the countryside is unchanged. Chen and Wu’s book was published too early to contain a balance sheet of the tax reform. But their subsequent personal fate is not encouraging. Despite its moderate and fundamentally pro-government stance, their book was removed from bookstores. The authors were subjected to a harassment lawsuit, which won a favourable reception in the courts and dragged on interminably. Their names, ideas and legal predicament were blacked out from the media. Ultimately, in self-defence, they reluctantly sought international publicity for their case. Chen and Wu’s book concludes with a survey of the opinions of some reformers within the Communist Party who are concerned regarding the needs of peasants. Their comments are muted but insightful. Agricultural specialist Zhu Shouyin condemns the role of the township authorities as “independent entities with monopolistic power that tended strongly toward the pursuit of profits”. Yu Jianrong, an agricultural researcher, contends that “there is no such thing as citizens’ rights” in China, “only the capital and power and privileges of a ruling clique”. What’s needed is a network of peasant organisations, truly representing their interests, to “rally the peasants … to replace the current local bureaucracy by peasant self-rule”.